Astronomers have a reputation for silly naming conventions, but their definition of a metal is perhaps silliest of all: any element with an atomic weight greater than Helium is a metal in an Astronomers eyes, including Carbon, Nitrogen, Lithium and Oxygen. All of these elements are created inside the cores of stars in the final stages of their lifetimes, when the Hydrogen and Helium that fuels their nuclear furnace is used up. The largest stars end their lives in catastrophic supernovae, scattering these metals into the surrounding environment. Subsequent stars forming nearby will be enriched with metals, so that stars born today are far more metal rich than those before them. The first generation of stars, Population III, are born from primordial gas composed almost entirely of Hydrogen & Helium, with no metals. Theorists have proposed that these stars would be massive (up to a thousand times the mass of the sun according to some models), burn incredibly brightly, and hence have very short lifetimes. Today’s paper claims to have identified such a population just 800 million years after the big bang, which may seem like an incredibly long time but in fact only represents a sixteenth of the history of the universe up until now. They use data from the Subaru, VLT & Keck observatories to identify and spectroscopically follow up two objects, named MASOSA and CR7 (The latter after a certain Portuguese football player). Strong Hydrogen and Helium emission is visible in the spectrum (see the astrobites guide to spectroscopy and spectral lines for further details), but almost no metal lines, suggestive of very metal poor stellar populations. Fig 1: Modelled spectral energy distributions fitted to the CR7 data for a typical stellar population (pink), a collection of population III stars on their own (black), and a composite population of metal enriched and metal poor stars (green). 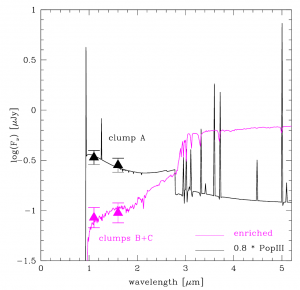 The black points with error bars show the observational data at different wavelengths. To investigate the properties of these galaxies the authors use mock spectra from physically motivated models of our current understanding of star formation and evolution. They use models for both ‘typical’ stellar populations, as well as for population III stars. The models for population III stars have a higher proportion than usual of heavier stars, reflecting theories that suggest population III stars are universally more massive. Fitting based on just a typical stellar population fails to explain the strong Hydrogen emission, and using a pure population III model under-predicts the flux in the infrared (see Figure 1). The authors instead use a model with both generations of stars, and argue that this best explains the spectrum observed. Whilst the MASOSA source appears compact, CR7 is extended, with a much more complex structure. Using follow up observations from the Hubble Space Telescope, they resolve CR7 in to three distinct components: two small and red, one large and blue. 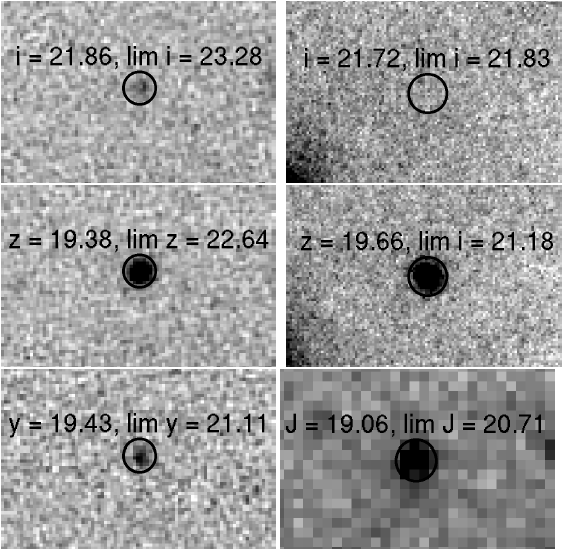 Photometry on the individual components confirms the suspicions; CR7 is made up of one young, potentially population III component and two red sources of older, metal enriched stars (see Figure 2). Fig 2: Hubble Space Telescope imaging allows the separation of each component in CR7. The triangular points show the real data, black for the supposed population III component, and pink for the two more metal enriched, redder components. The full spectral energy distributions show the best fit models for each component. What could cause such a mixed population? The authors suggest a galaxy merger might be to blame, or alternatively they propose an intriguing ‘wave’ of population III star formation. In this scenario star formation ignites first in the dense core of a halo, and then moves progressively out to the edges. In fact, the authors make the case that since population III stars are born in the early universe, before cosmic reionisation (for more details on the epoch of reionisation see here, here and here), they may only ever be observable in such mixed systems. One of the key tracers of population III stars, hard ionising UV photons, are absorbed by neutral hydrogen and only in a system where the majority of the surrounding hydrogen has already been ionised by an earlier population could the observed ionising photons from the current stellar population escape. 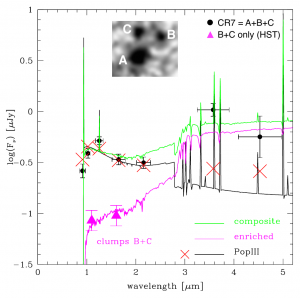 The authors do investigate some of the alternative explanations for CR7‘s extreme spectroscopic properties, including cooling radiation, feedback from super-massive black holes and strong stellar winds, or directly collapsing black holes. But these, they argue, fail to explain all of the observed features of the spectrum. There is, however, a reasonable amount of uncertainty surrounding the models used to generate the predicted spectrum, especially for population III stars, since we are still unsure how such a population should look and behave. So are we seeing the first ever glimpses of light from the first generation of stars? The evidence so far is compelling, but further observations, in particular spectra from the James Webb Space Telescope, will shed further light on this exciting claim in the not so distant future.